Despite its reputation as the perfect metal for beer brewing, stainless steel can actually corrode or rust. 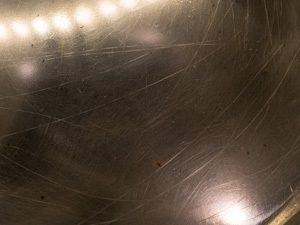 So this week we take a look at how and why stainless steel can corrode as well as how you can passivate your stainless steel beer brewing equipment to protect it. Steel is made from a combination of iron and carbon, and the carbon makes up only a half percent or so of the steel. In contrast, stainless steel is made from iron and chromium. Chromium is as much as 10-30% of the steel composition, and it is the critical element that makes stainless steel corrosion resistant. The chromium in stainless steel reacts very quickly with oxygen and actually forms a protective layer of chromium oxide on the surface of the steel. This chromium oxide prevents rust and corrosion. However if the chromium layer gets breached for some reason, then the iron in the steel may actually start to corrode and rust. Your stainless brewing equipment is generally very corrosion resistant. However if you expose it to bleach or other bleach-cleansers, scratch it, scour it excessively, or expose it to non-stainless steel scouring pads (such as steel wool) or leave it in contact with plain steel it can wear off the protective layer. Bleach products can remove the protective layer. Excessive scouring, particularly with steel wool can also erode your oxide layer. In general you should keep regular steel such as that used in common cans, tools and some equipment away from your stainless equipment. The iron from regular steel tends to rub off onto the stainless steel (iron-affinity) and erode the oxide layer. Don’t stack regular steel pots, mixed metal tools or equipment in your stainless pot after brewing. When stainless steel is produced it is typically dipped into a bath of nitric acid near the end of the manufacturing process to remove contaminants. The acid also exposes the chromium to oxygen in the air, which activates a process called passivation where the oxygen bonds with the chromium to form a protective chromium oxide layer. Passivation happens very quickly – usually within 20 minutes. Now some stainless brewing equipment, particularly lower cost stainless components, may have been machined, stamped, etched, buffed or welded after the stainless steel was manufactured and acid washed. As a result it may have oils, buffing compounds, welding compounds and other contaminants that are protecting the steel, but could be washed away the first time you clean your parts. In addition, you probably don’t want these oils and compounds in your beer. Since you probably don’t have access to a large nitric acid bath, passivation at home begins with a very thorough cleaning. If it is new equipment you want to remove any compounds left over from the manufacturing and finishing process. This requires a strong cleaning agent like Tri-Sodium Phosphate (TSP). Mix the TSP at the recommended strength with hot water. Bar Keeper’s Friend is also a good cleaning agent for stainless though you should not use it on etched metals. They also sell a “soft scrub” liquid version of Bar Keeper’s Friend which is easy to use. For used equipment you may be able to get away with using regular brewery cleaning agents such as PBW since most of the contaminants in brewing equipment are organic. Make sure you remove all of the fittings, valves, and other small pieces and clean those as well. Rinse thoroughly and dry after cleaning. Now that all dirt, oils and contaminants are removed, the next step is to passivate the metal. This is done by applying a mild acid and then allowing the piece to air dry. Oxygen in the air then will bond with the chromium forming the passive protective layer. Always wear gloves when working with these acids as they can irritate the skin in high concentrations. There are several alternatives you can use here. One option is to use “Bar Keeper’s Friend”, which is a stainless cleaning agent containing oxalic acid. It works well on stainless, but don’t use it if you have electronic etching as it will fade or even remove the etching. Add just enough water to form a thick paste and apply the paste to the item you want to passivate. Let it sit on the metal for 5-10 minutes and then gently rub it off and dry with a towel. Alternately you can rinse with clean water, but you should immediately dry it with a towel so the metal gets quickly exposed to air and not water. Another agent is a high concentration of Star-San sanitizer, which is acid based. Where normally you would use about 1 oz in 5 gallons to sanitize, for passivation you need to use 1 oz per gallon. Soak the parts in concentrated star-san for 20-30 minutes at room temperature, and then allow them to air dry overnight so the oxygen can passivate the metal. The next day, give each piece a thorough rinsing as it will still have some acidic residue before brewing with it. A final option is citric acid, which is widely available in raw powder form. Passivation can be accomplished at a 4-10% citric acid concentration in warm water in about 30 minutes. Again you want to air dry and let the oxygen do its work overnight before you rinse any residual acid off. For new equipment it depends highly on the source of the equipment. High end equipment is often dipped in nitric acid as one of the last steps in production, and may need only a good cleaning to remove oil residue before first use. For less expensive, often foreign made equipment, many manufacturers machine, weld, buff, and work steel that probably was protected at some point, but they may skip a final dip after manufacturing to save money. Unless you know the source of your equipment, I would lean towards both a thorough cleaning and passivation step with new stainless equipment. A thorough cleaning is required no matter what to remove oils, buffing compounds, and other contaminants that could ruin your beer. The extra step of passivating it after cleaning is not a high price to pay since stainless steel equipment is relatively expensive and can last a lifetime. You should also consider passivating your stainless any time you think you have damaged the protective layer of chromium. This includes a particularly stubborn stain that required you to scrub excessively, any scratches, nicks or dents to the stainless, exposure to regular steel, steel wool, or iron metals, or exposure to bleach cleaners. In addition if you brew frequently its not a bad idea to passivate every year or two just as a preventative measure. Be careful with storing iron or other mixed metal tools in your stainless pot or fermenter. Iron based tools or mixed metal equipment can react with iron and erode the chromium oxide level. Its best to only store other stainless or plastic tools and equipment with your stainless equipment. Finally if you do get rust or corrosion, its important that you correct it immediately. A mild abrasive like Bar Keepers Friend can often help you remove the rust and will also passivate the area to prevent further damage. Thanks for joining me on the BeerSmith Home Brewing Blog. Be sure to sign up for my newsletter or my podcast (also on itunes…and youtube…and streaming radio station) for more great tips on homebrewing. Thanks for posting this blog entry. I’d like to use citric acid to passivate. How much 99.9% pure anhydrous citric acid should I use in 7 gallons of water to achieve 4-10% concentration? Do I need to do that by weight or what is the easiest way to calculate it? Thanks. Thanks for this nice posting keep it up! Very Informative article on how to prevent corrosion on Stainless Steel. 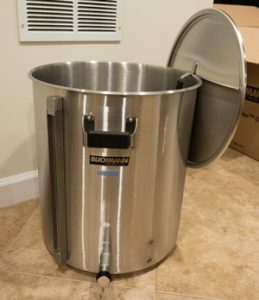 Thanks for sharing this information about stainless steel..
Hi, curious if using the StarSan concentration would I want to fill the entire 10 gallon brew pot? As you stated to soak the parts. Or can it be sprayed on, since it has a high foaming rate?